The attack came out of the blue and out of the night. Beneath the shadow of The Shard, Europe’s tallest skyscraper, terror hit Britain’s streets again. 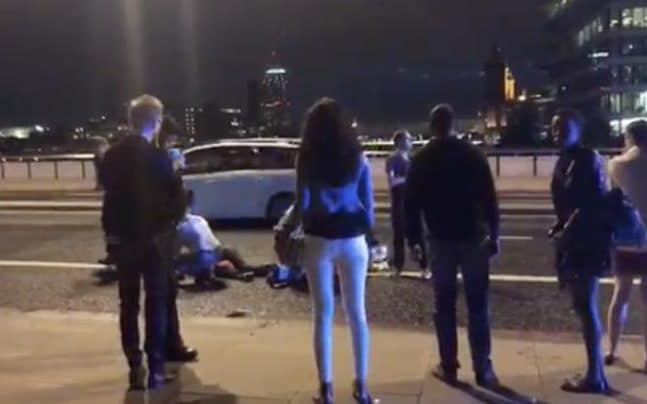 At shortly after 10pm, a white B&Q van being driven at speeds of up to 50 miles per hour mounted the pavement at London Bridge and ploughed into pedestrians, knocking them down like skittles. Reports suggested some victims were thrown into the water of the Thames below. Others may have jumped in in an attempt to avoid the speeding vehicle. The van came to a halt on the south side of the bridge but it wasn’t the end of the carnage. Three men wielding knives 10 inches long began attacking passersby, even entering at least one restaurant to attack Saturday night diners. One report suggested throats had been slashed by the marauders, likely to be Islamic State-inspired terrorists – although that had not been confirmed by the early hours of this morning. One eyewitness spoke of the men shouting “this is for Allah” as they stabbed indiscriminately. The death toll was unclear at first but later rose to six; the number of injured is over 30. At 1.30am on Sunday, a series of explosions, thought to be controlled, were heard at Borough Market, according to Telegraph reporter Kate McCann at the scene. Theresa May declared it a terror incident and is returning to London to chair an urgent meeting of Cobra today. A taxi driver told of the carnage. Giving his name only as Paul, he spoke of seeing several people lying dead or injured on both sides of the road. Pedestrians screamed in terror as they ran for their lives. “It’s happening,” said one young woman as she raced for cover. A taxi driver told LBC radio what he saw: “A van came from London Bridge itself, went between the traffic light system and rammed it towards the steps.